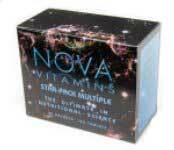 Nova Vitamins began in 1977 with the wisdom of Dr. Bernard Jensen DC PhD (1908-2001) who formulated their products. Dr. Jensen’s passion was in holistic health, treating the whole body and Nova Vitamins is grateful to deliver this wealth of health for now 40 years to you and your families. "Today, after having worked with over 350,000 patients around the world, I am firmly convinced that nutrition is the greatest single therapy to be applied in the wholistic healing arts and that we must treat the whole patient, not just the disease." Factors such as your body’s ability to absorb and use nutrients (bioavailability and dissolvability) play major roles with how effective supplements are in promoting optimum nutrition for the whole body. Nova’s products have all the right factors! Nowhere in the formulas has expense ever been considered over nutritional value! You will not find ingredients such as Calcium Carbonate, Magnesium Oxide or Ascorbic Acid, these ingredients save manufacturers money yet studies show they have little absorption abilities. Nova offers the highest Quality plus Affordability! Your body does not create its own vitamins and minerals and we cannot rely on soils today to provide them in our produce. Try Nova risk free for 30 days and feel the difference! them all with a 30 day money back guarantee. Nova offers a retail or wholesale program to fit your needs.